PurdueAV2003 wrote: I, too, can blame the Funnies section at TFW2005, but, more precisely, I can blame the WTF@TFW crew and ShadowDragon! It started when I heard the WTF@TFW podcast mention these "creepy" little Busou Shinki figures. There were actually hating on them, but it got me curious as to what they were. I checked out the "Show Off" thread over there and they peeked my interest, but not enough for me to buy one. While in that thread, I clicked on SD's sig for his TransShinki World comic, and ended up reading through the hole thing in one night. As I did, the Arnval design really grew on me, so I took the plunge. OK i'll ask: what episode of WTF@TFW was that?? rubixbox wrote: Huh, didn't know they actually payed attention to the slowly-growing Shinki fanbase. oh... i feel honored! thank you! It was the podcast 58, IIRC. And yeah, hearing them hating on the shinkis was kinda fun. My first encounter with Busou Shinki was through the wads of photocomics that featured them on tfw2005. I did a little research (not enough really; more on that in a bit) and found a cool figure that was reasonably priced and looked interesting. That figure was WaffeBunny. I quickly learned the reason why she was so reasonably priced; she was a bodiless EX set. So after I realized my mistake, I ordered the next figure that interested me which was Benio. As a kid I played with the Mego Micronauts (Mego imported them from Takara's Microman toyline in the 1970's). A few years before Takara's merger with Tomy, Takara released some updated Microman figures to coincide with the 25th Anniversary of Microman called MicroForce. The figures have great articulation and come with a bunch of weapons. After the merger, the line was dropped and I guess I was jonesing for some figures that had lots of articulation and accessories that you could configure freely and Busou Shinki fit the bill pretty well. I was actually drawn to Busou Shinki because of Fumikane Shimada's works. I was aware of the Mecha Musume concept around 2005 with the release of Fumikane-sensei's Mecha Musume girls (the American and German tank girls coming to mind). Then came Strike Witches in 2007, which I really liked. The idea of lean, mean warmachines turning into (seemingly) cute little girls sorta got me thinking about the future of, well... a lot of comic ideas. Some mecha musume games (Gadget Trial) help to cement my interest even further. The very first Shinki that caught my eyes was Murmeltier and Asuka, which was very close to the original Fumikane Shimada's prototypical designs. However, it wasn't until this April when I finally bought my first Shinki - Oorbellen. I've been working on Mecha Musume designs for a couple of years already and I'm really excited at finally bringing some concrete designs to life. Waaaaaaaaay back then, I was just browsing the net for random images of mecha, and that was then I discovered busou shinki. 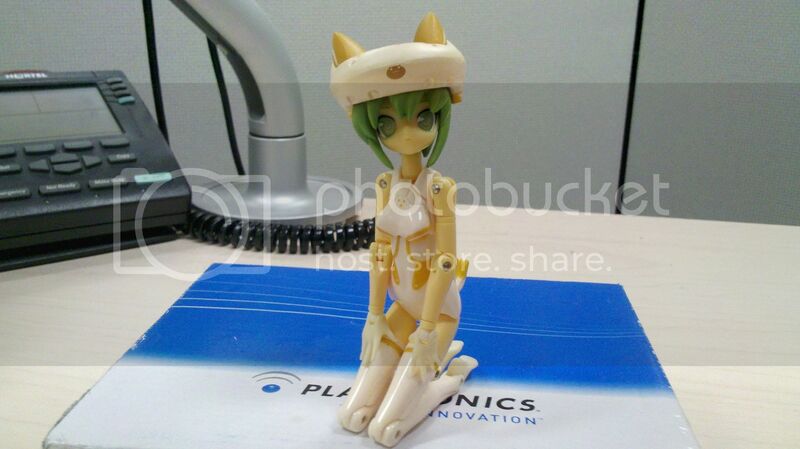 Featured are pics of Arnval, Strarf and Waffebunny, and some from Wave 2 and 3, and concept images of the plant girls. I never really put much thought into getting any of them especially since it would be impossible to acquire them in our country back then, but I was interested. To add on to this: The story of how I actually started collecting these figures began on Halloween of 2010. At this time, I was aware of the existence of the Busou Shinki and Figma lines, and was constantly infuriated by being unable to find these figures or buy them, and Amazon was out of the question (Since I couldn't exactly beam my allowance I did have into my computer). On Halloween, the local comic store, Tate's, was having a huge sale/event. Tate's has some good stuff, so I went there with my mother and uncle. As soon as I walk in, sitting there on a shelf near the cash register, totally unexpectedly, I find....Figma Black Rock Shooter, one of the figures that I really wanted to buy back then. I didn't get her that day, mainly because of the $40-50 dollar price. A couple weeks later, I go back to Tate's with my uncle. We usually go there like once a month, just to check out what merchandice they have there. Sure enough, sitting on that shelf near the cash register, was BRS. To this day, I still don't know how the heck I convinced my uncle to buy her for me (Of course, it was close to my birthday, so that might have been something to do with it), but he did so anyway. He spent the entire car ride home making jokes about how BRS wanted to give me smooches. As soon as I got home , I took some pictures, made a little photocomic, and placed her on my "Not-TF" shelf. One year later, it now has four Figmas, four Shinkies, a Chogokin Knight Gundam, and two Revoltech Transformers. Nope, not wrong. Not wrong at all. With me it started with Fun-ness on a Stick. 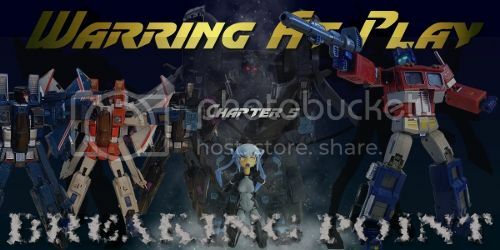 The comic had started off following the adventures of Bob the Knockoff Brave toy, a beat up old Powermaster Prime, and others, but at some point DilaZirk cut to his college dorm room (I think, correct me if I'm wrong) and a little catgirl figure he had picked up there, named MaoChao. Everyone was instantly interested in her, because she was adorable, and eventually it was revealed she was a Busou Shinki. I especially enjoyed how he had her interact in his comic, and out of curiosity I decided to look up Busou Shinkis, thinking they were all like MaoChao. MaoChao was cute, but at the time wasn't really my thing. But then, I saw pics of Arnval, Strarf, Tsugaru and Eukrante, and my opinion changed rapidly. Eukrante in particular captured my attention. I sadly realized that Tsugaru was an EX set, and would only work if I had another Shinki to use as a body for her, so I passed on her. That brought me to Eukrante, and a two pack. I really wanted Eukrante, but the two pack was nearly the same price. I decided that I should get the two of them, to see if this line was something I'd be interested in, and hunt down Eukrante another day. That two pack? Arnval and Strarf. And MaoChao? I think she's forgiven me for taking so long to get one myself.